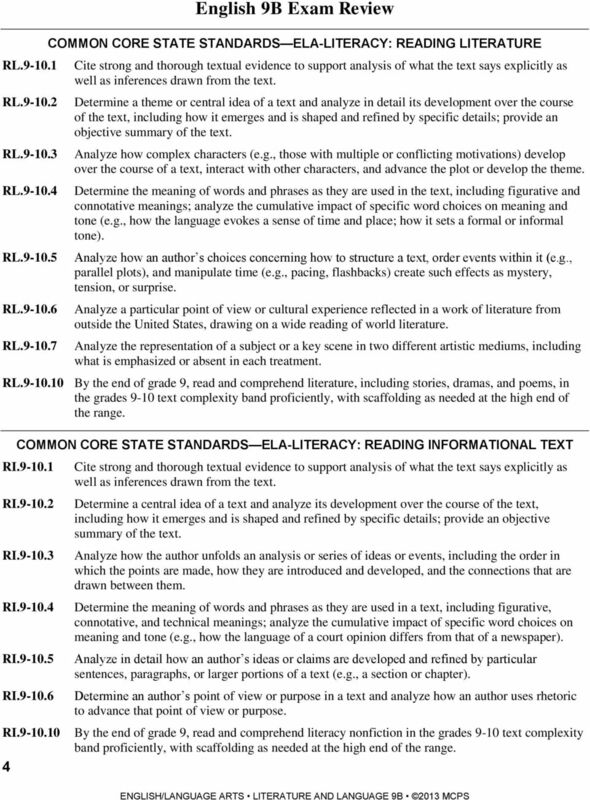 Download "Montgomery County Public Schools English 9B Exam Review"
4 RL RL RL RL RL RL RL English 9B Exam Review COMMON CORE STATE STANDARDS ELA-LITERACY: READING LITERATURE Cite strong and thorough textual evidence to support analysis of what the text says explicitly as well as inferences drawn from the text. Determine a theme or central idea of a text and analyze in detail its development over the course of the text, including how it emerges and is shaped and refined by specific details; provide an objective summary of the text. Analyze how complex characters (e.g., those with multiple or conflicting motivations) develop over the course of a text, interact with other characters, and advance the plot or develop the theme. Determine the meaning of words and phrases as they are used in the text, including figurative and connotative meanings; analyze the cumulative impact of specific word choices on meaning and tone (e.g., how the language evokes a sense of time and place; how it sets a formal or informal tone). Analyze how an author s choices concerning how to structure a text, order events within it (e.g., parallel plots), and manipulate time (e.g., pacing, flashbacks) create such effects as mystery, tension, or surprise. Analyze a particular point of view or cultural experience reflected in a work of literature from outside the United States, drawing on a wide reading of world literature. Analyze the representation of a subject or a key scene in two different artistic mediums, including what is emphasized or absent in each treatment. 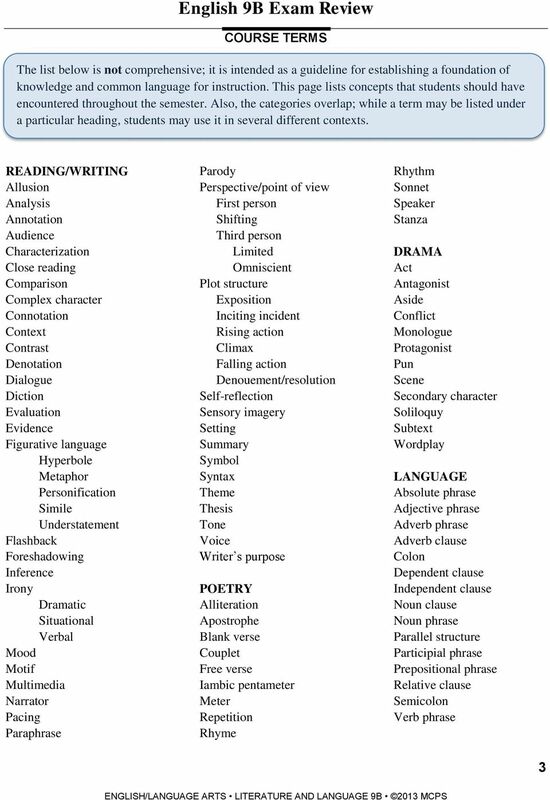 RL By the end of grade 9, read and comprehend literature, including stories, dramas, and poems, in the grades 9-10 text complexity band proficiently, with scaffolding as needed at the high end of the range. 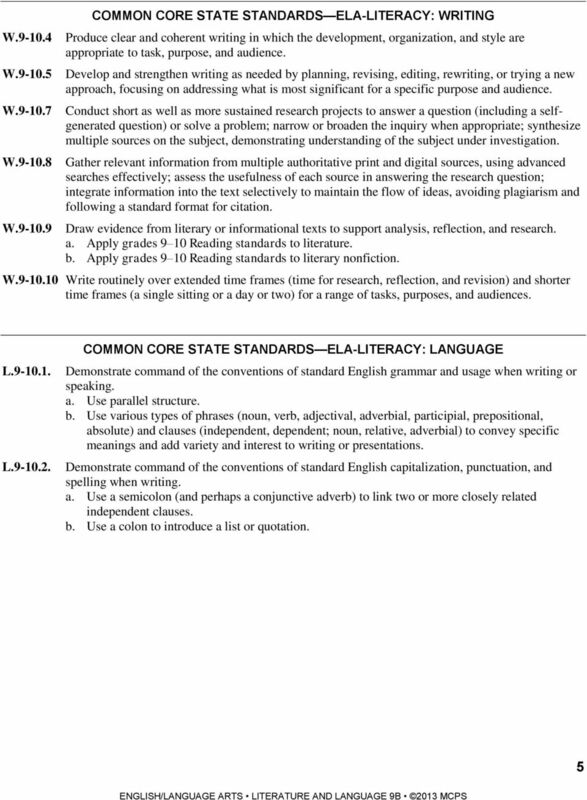 COMMON CORE STATE STANDARDS ELA-LITERACY: READING INFORMATIONAL TEXT RI RI RI RI RI RI RI Cite strong and thorough textual evidence to support analysis of what the text says explicitly as well as inferences drawn from the text. Determine a central idea of a text and analyze its development over the course of the text, including how it emerges and is shaped and refined by specific details; provide an objective summary of the text. Analyze how the author unfolds an analysis or series of ideas or events, including the order in which the points are made, how they are introduced and developed, and the connections that are drawn between them. Determine the meaning of words and phrases as they are used in a text, including figurative, connotative, and technical meanings; analyze the cumulative impact of specific word choices on meaning and tone (e.g., how the language of a court opinion differs from that of a newspaper). Analyze in detail how an author s ideas or claims are developed and refined by particular sentences, paragraphs, or larger portions of a text (e.g., a section or chapter). Determine an author s point of view or purpose in a text and analyze how an author uses rhetoric to advance that point of view or purpose. 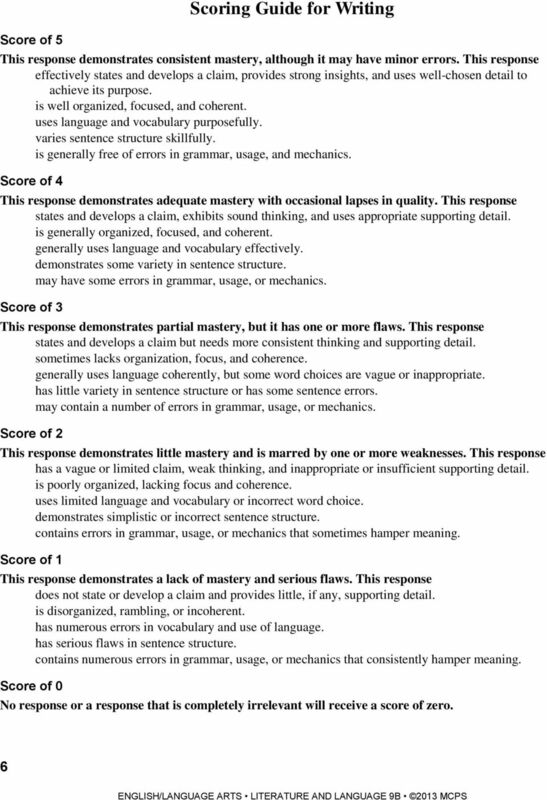 By the end of grade 9, read and comprehend literacy nonfiction in the grades 9-10 text complexity band proficiently, with scaffolding as needed at the high end of the range. Units of Study 9th Grade First Semester Theme: The Journey Second Semester Theme: Choices The Big Ideas in English Language Arts that drive instruction: Independent thinkers construct meaning through language. 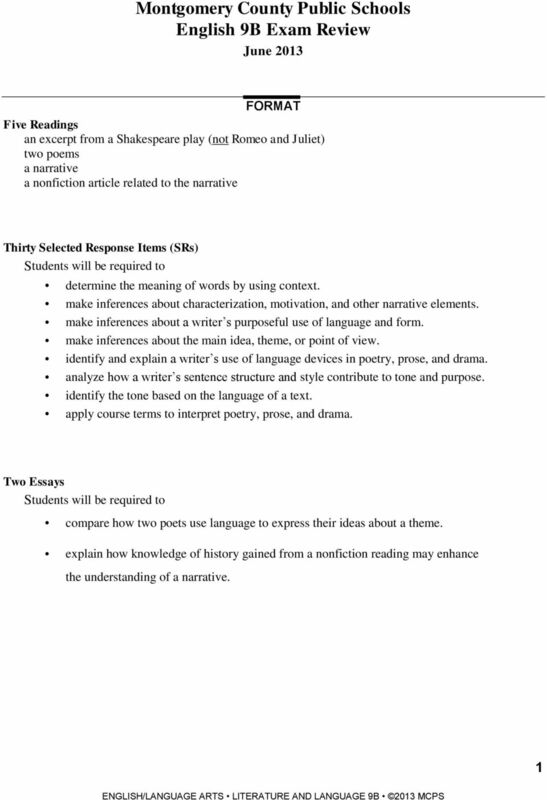 10th Grade English Objectives Note Taking Students will be able to take notes in their own words from written or oral presentations using a variety of techniques. Demonstrate effective listening skills. Reading. Reading for Information. Kindergarten. I can give details an author gives to help make points about a text. Format: The format of a dialectical journal is specific. Make sure you follow this organization so you do not lose points on this assignment. Reading: Academic Grade Level 9, 10, 11, 12 Course Number 100 Subject Area English Language Arts Course Description This course is designed to assist readers of all levels in developing to their full potential. Unit Essential Questions: What is the relationship between change and growth? How do writers use different types of writing to express their ideas? STAAR Sample Short Answer Questions ENGLISH I, II, and III Single Selection: Literary In this excerpt from Anne of Green Gables, do you think the stage directions enhance your understanding of the scene? By the end of the twelfth grade, students will identify the main idea and supporting details in what they have read. 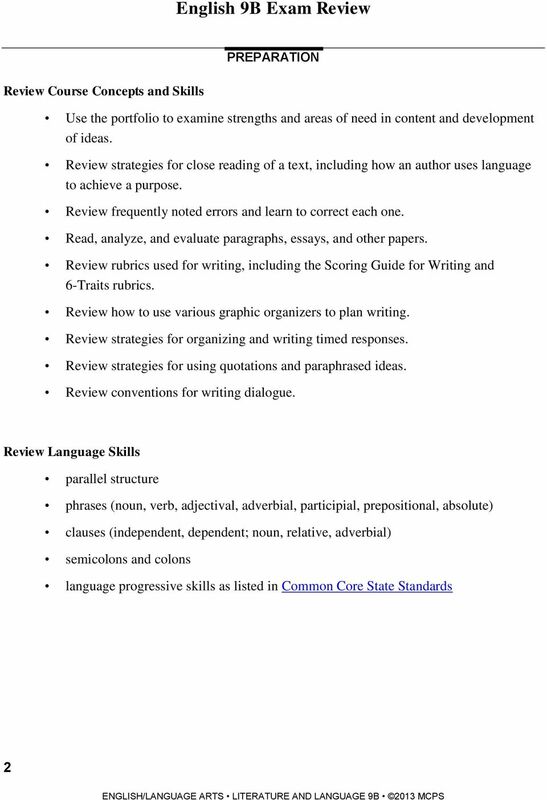 Revised ASD June 2004 AK + ASD Writing For Grades 3-6 The first row of each table includes a heading that summarizes the performance standards, and the second row includes the complete performance standards. Rising Action. The action and events that take place in the story and build up to the critical moment when the main conflict is confronted.